Out of 193 countries recognized by the United Nations all but a small few have a Central Bank in them. ..
"I am afraid that the ordinary citizen will not like to be told that banks can and do create money ... and they who control the credit of the nation direct the policy of Governments and hold in the hollow of their hands the destiny of the people"
Through the internationally linked Central Banking system, nations have yielded the control, value, regulation, and supply of ALL money within that country. These countries do have the sovereign right as nations to regulate, print and control the value of their own currency without any cost to the government or their people, but instead they have allowed a privately held institution called the Central Bank to manage this fundamental right for a country at the cost of interest. If you take out a loan from a bank, you are expected to pay back that loan and any additional interest accumulated over the life of the loan. If you cannot make your payments, your assets that were purchased with the loan are commandeered by the banking institution in an attempt to make good on the loan. In this same way nations are also expected to payback, the amount of loans they take out in the form of civil development projects, expansive social and government programs, and national defense budgets. These loans are backed by the taxpaying citizens of any respective country and the taxes collected are used to pay the interest on Government loans. As a nation’s government grows and the country develops, it requires more and more infusions of money via this system of interconnected central banks and private banks to pay for the projected growth. In this way a central bank having control over the money supply of a nation is in total control of the government and development of private businesses and industry within the country of operation. The concept behind all modern banking systems is called the Fractional Reserve System. Essentially when a banking institution is formed, investors come together to provide the tangible liquid assets which serve as the “reserves”. This is usually gold, silver, and real estate, something with intrinsic universal value. Once these assets have been transferred to the newly formed banking institution it can begin lending out money to individuals and organizations in multiples many times greater than the actual value of the reserves held by the bank. The end result is the lender is creating money and lending it out to debtors well over the amount of reserves held by the bank relying only on the fact that no one single depositor will withdraw the sum total of reserves placing the bank in a default status. This is how we get the concept of inflation; banks create many times more paper currency or digital transactions than actual assets deposited with the bank. The amount of money in circulation relative to the amount of reserves in the banks is what causes the value of the currency to go up and down. In this way the shareholders are creating money out of thin air lending it to private parties and governments and then charging them interest on assets that don’t really exist. An excellent breakdown of the fractional reserve system can be found in this short film called Money as Debt. So we see that the shareholders in any bank whether a private bank or a nations central bank are making money hand over fist by putting up a limited amount of their own tangible assets. The shareholders of a central bank are always private individuals or other banking institutions and are there for the sole purpose of making money off of money. This is a problem for nations because the banks are chartered for the sole purpose of making money and don’t always have the loyalties or best interest of their host country in mind. In fact many central bank shareholders who almost never make themselves known preferring to remain anonymous do not reside in the country, but are internationalists and proponents of a central global financial institution called the World Bank. 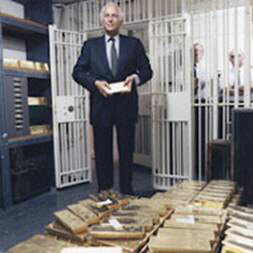 Central Banking is a sophisticated vehicle of enslavement owned and operated by the British Aristocratic and banking dynasty families, families like the Rothschild’s who hold trillions of dollars in hard assets like Gold and real estate. These families are exceedingly wealthy and teach their offspring the secret art of debt warfare to assure each successive generation and family line retain their position on the top of the pyramid as behind the scene manipulators of world events. The fact that almost every nation on the planet has a central bank is proof positive that the methodologies and tactics of these internationalist “shareholders” are ingeniously effective towards their efforts. Every country that has succumbed to the Central Bank has a story of manipulation, lies and coercion attached to its formation. The central bank is a Trojan horse, once inside a host country it begins to take over the process of money regulation and lending. Having achieved this, corporations and governments are encouraged to take out large amounts of debt to stimulate industry. After many years of free access to money, corporate and governmental organizations have developed products, manufacturing, infrastructure, and housing and commercial centers within the nation with this influx of cash. At a predetermined time set by the banking elite, the Central bank begins to dry up credit by artificial means. This throws whole sectors into financial ruin causing layoffs, down-sizing, and bankruptcy of vital institutions within the nation. The Bankers can then use their vast wealth to buy up, consolidate and merge their own entities with that of the state further increasing their stranglehold on the nation. In this way countless 3rd world countries have been enslaved, and now with the global financial meltdown of the western nations the World Bank collective is bailing out and collapsing nation states as a means of forcing the entire world onto a centralized monetary system. The power they have always wielded behind the scenes is now being brought to bare in a very visible and powerful way against the free nations of the world. John Perkins writer of Confessions of a Economic Hitman describes the processes the IMF and World Bank use to inflate growth projections ensnaring nations into massive World Bank loans that can never be paid back. What does the Bible Say about Money and Banking? The Bible is very clear and strictly forbids for Christians to allow themselves to be yoked with debt. The Central Banking system is based on what is termed in the Bible as usury and is reprehensive in the sight of the Lord. Usury is defined as the practice of lending money and charging the borrower interest, especially at an exorbitant or illegally high rate. The fractional reserve system utilized within the central banking system is infinitely beyond this definition laid out in the Bible of Usury, today’s banks are lending out money that they don’t even have, simply stamping paper calling it money and charging the borrowers interest. Paper is not money and the Bible specifically tells us what our money and exchange currency should look like if we are to be society based on just weights and measurements. Currency that limits the amount of usury that goes on with in a society to prevent people from using the banking system to steal wealth. Thou shalt not have in thy bag divers weights, a great and a small.Thou shalt not have in thine house divers measures, a great and a small. But thou shalt have a perfect and just weight, a perfect and just measure shalt thou have: that thy days may be lengthened in the land which the LORD thy God giveth thee. The banking establishment that has gripped the world is not based on the Laws of the Bible instead are instruments of financial oppression and slavery. In fact the founding fathers having recognized this started the Reveloutionary War over the financial oppression and taxation from the British crown and their words and writings reflected their hostility towards the European Banking establishment. "The Central Bank is an institution of the most deadly hostility existing against the principles and form of our Constitution. I am an enemy to all banks, discounting bills or notes for anything but coin. If the American people allow private banks to control the issuance of their currency, first by inflation and then by deflation, the banks and corporations that will grow up around them will deprive the people of all their property until their children will wake up homeless on the continent their fathers conquered." "Paper money has had the effect in your state that it will ever have, to ruin commerce, oppress the honest, and open the door to every species of fraud and injustice." (letter to J. Bowen, Rhode Island, Jan. 9, 1787) "If ever again our nation stumbles upon unfunded paper, it shall surely be like death to our body politic. This country will crash." "I believe that banking institutions are more dangerous to our liberties than standing armies. Already they have raised up a money aristocracy that has set the government at defiance." "All the perplexities, confusion and distress in America arise not from defects in the Constitution or Confederation, not from a want of honor or virtue so much as from downright ignorance of the nature of coin, credit and circulation." Gentlemen, I have had men watching you for a long time and I am convinced that you have used the funds of the bank to speculate in the breadstuffs of the country. When you won, you divided the profits amongst you, and when you lost, you charged it to the bank. You tell me that if I take the deposits from the bank and annul its charter, I shall ruin ten thousand families. That may be true, gentlemen, but that is your sin! Should I let you go on, you will ruin fifty thousand families, and that would be my sin! You are a den of vipers and thieves.I intend to rout you out, and by the grace of the Eternal God, will rout you out. Jesus forced out the money changers of the temple, the Love and favor of God could not be bought or sold only by fullfilling the commandments of God were we to have favor with Him. Those who are intent on ensnaring people with the burden of debt like the money changers are out of favor of God simply because they have no love for their fellow man. They have forgot to love one another as taught by Jesus Christ. The dire finacial straits the world finds itself in is simply because we have forsaken tried and tested thousand year old guide lines found in the Bible as to how we should conduct business with our neighbors. Be smart educate yourself and hedge your real assets in knowledge and freedom as far away from these fraudulent and swiftly tumbling institutions of greed as you can.